At my last flax weaving workshop, in addition to showing people how to weave small baskets and large containers, I invited more experienced weavers to learn how to make an open-weave basket — kupenga kete — and four people took up the offer. I’d woven my kupenga kete a few years ago and the questions Beryl, Kath, Gill and Oz asked while weaving their baskets reminded me of the things that need to be worked out as the basket is woven and I thought I’d share this information. When gathering flax for this basket, choose firm flax as the strips need to be quite firm to retain the shape of the open weave in the basket. 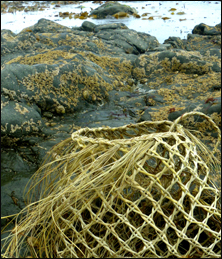 The basket I’m using to illustrate this post is woven with 64 strips that are 0.5 cm wide, with fine fibre, or muka ends. The number of strips required needs to be divisable by 8. To check if the length of plait in between each set of strips is right, hold up two strips from each set together at the top to show the shape of the diamond. If the strips are too far apart, the diamond will be too big, so reduce the number of plaits between each set of strips addition. Once all of the strips are added in and the plait is tied off, then weave the sets of strips on one side to start the pattern. The strips from each set of four are firstly woven together by weaving the right strip over the left strip in both sets of two. Then weave the second strip over the third strip which sets them in the right place for the pattern. Peg in place and repeat for all the sets of strips on one side. The two strips left at each end are used to weave the corners. Cross the two strips (I always cross the strips in the same direction as it helps to keep the pattern looking well-made and attractive), and then take the left set of crossed strips from the first set on the left and the right set of crossed strips from the adjacent set and weave the two sets of strips through each other in under/over — taki tahi — weave. Go to the next four strips and repeat this across to the end of the plait on this side. Look at the half diamonds that have been created along this first row and make sure they are basically the same size and shape. If they aren’t adjust the tension to make them as similar as possible. Repeat this crossing of two strips and then weaving four strips together across the side two more times and there will now be full diamond shapes created with the weaving. Peg in place and repeat on the other side. Fold both sides up together and then weave the corner together with the two strips left at the end of each side. 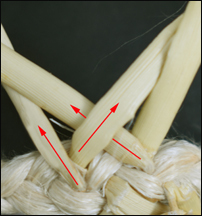 Before weaving any higher, secure the ends of the plait inside the kete with a tie so that they lie flat and neatly along the inside of the plait. Once the sides are completed to the height you want, finish with the four weave crossing and peg the strips in place. Comb the ends out into fibre and plait these together for the top edge. To do this, I use a set of three narrow flax strips tied together to start the plait and then bring each bunch of fibres from the end of each strip into the plait as in French plaiting. See pages 78-82 in my book Weaving Baskets, Backpacks, Boxes and Other Projects for instructions on working this technique. Doing this plait quite tightly around the top can create a stunning sculptural piece. There are different ways to finish the plait. 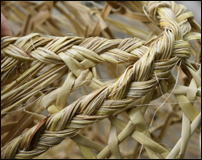 For example, the end of the plait can be threaded through to the inside of the rim and tied in place or the plait can be lengthened to make a decorative finish. 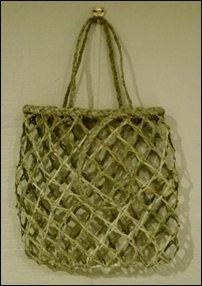 The ends can be left on or cut off as in Gill’s kete illustrated here. It was good to see others weaving this basket as it highlighted the things to think about and observe in the weaving. I hope you find this useful when you weave your own kupenga kete, and do send me photos of your finished weaving. I’d love to see them and share them here. When I notify buyers of my books that their order has been sent, I ask them how they found out about the books. There are many answers to this question — people have heard about them through friends, weaving groups, schools or university courses and often, especially overseas buyers, people discover the books through internet searching. I recently sent my book Weaving Flowers from New Zealand Flax, to Deborah Tuzon in Hawaii. She wrote, “I am a lauhala weaver who has not been able to weave for almost 8 years due to osteoarthritis in both my thumb joints. Surgery was done in both so now I am starting again. I used to make a flower that looks like an anthurium and I had lost my example. So I was looking online at different websites and I saw a flax flower on Pinterest that reminded me of it. It led me to your site. I have been making flowers for my crownless hats.” The flower Deborah has woven for her hats, which are illustrated in the stack of hats in the first photo on this page, is the flower I call an Arum Lily on pages 56 - 63 in my Flowers book. 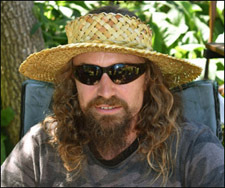 Hats, or pōtae, are fun to weave and this style is a good one for beginners to start with. 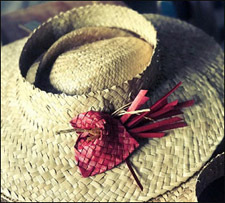 To weave a crownless sun visor-style hat similar to Deborah’s lauhala one and like the one pictured here, you can use instructions from my book Weaving Baskets, Backpacks, Boxes and Other Projects, which, although they are instructions for weaving baskets, can be used for this style of hat too. Start by working out the size you want the crown of the hat to be. This is the measurement around the widest part of the head where the hat will sit. Use the instructions for weaving a cylinder on page 119 of the Basket book and add enough strips to the cylinder to make the size for your hat. For a size of 56 cm circumference, I used 68 strips of just over 1 cm wide (which dried to 1 cm wide) for the cylinder. 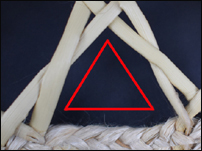 Once the cylinder, or crown of the hat, is woven and joined, finish off one edge. Now add in extra strips for the brim at the other edge of the cylinder. For this hat I split the strips to make a finer weave for the brim. I wove one row and then added 23 cm strips of the thinner .5 cm width, making 46 strips added altogether (the added strips are doubled over to use both ends). See pages 101 - 103 of the Basket book for instructions on how to add strips in. Weave a few rows for the brim — I wove a wider brim but it can be narrower than this — and then finish the edge of the brim off. The crown of this hat is a bit high and I suggest weaving 3 or 4 rows for the crown rather than the 5 rows that I wove. If you weave a hat like this, do send me some photos that I can add to this post. Everyone weaves differently and it’s great to share ideas. 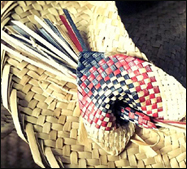 Crafting personal jewellery from natural objects is a universal and ancient pastime so it’s not surprising that people who work with New Zealand flax, harakeke, make jewellery as well as baskets, hats and other larger items. 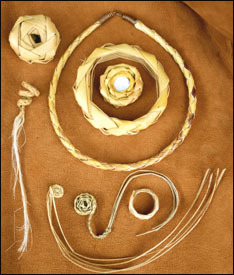 A variety of interesting jewellery pieces can be fashioned simply by plaiting four strips of flax into either an enclosed, rounded plait or an open curved plait and then shaping the plait into a necklet, earring, brooch or bracelet. 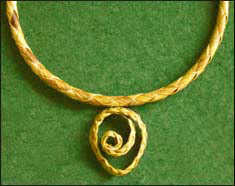 For example, the pendant illustrated above shows the rounded plait being used to make a necklet and the curved plait being used to make a pendant shape to hang from the necklet. The curved version of this four-plait works well to make various shapes of pendants, like the two heart-shaped pendants illustrated here. The pendants are made by curling the plaited flax into a koru shape — a spiral shape based on the appearance of a new unfurling silver fern frond — at one end and then curling it up in the reverse direction the other end, leaving a single piece of plait in between them. The point of the heart is shaped by pinching together the single strip of flour-plait between the two koru shapes while the flax is still soft and shaping it into a curved point. The heart shape is held together with a small stitch with thread in the centre. A waxed linen thread is added for hanging. The green pendant’s shape is a classic heart shape but I rather like the offset shape of the naturally-coloured pendant which is made by joining the two koru shapes so they are slightly offset from each other. I’ve played around with a few different ideas for making jewellery with a four-plait, including enclosing a small shell or stone in the centre of the koru. The curved four-plait makes a nicely rounded bracelet, or a ring. A smaller version of the bracelet could be used for napkin rings, or with a few more layers, a toggle to hold a scarf if the hole in the centre is a bit larger than the one illustrated here. I like long tails on the koru but haven’t yet found any practical jewellery use for this style, although I can see it being used in other ways. Do you have any more ideas for koru jewellery? I’d love to see them. I’ve written instructions on how to make the curved four-plait here and there are instructions for the rounded four-plait cord on this blog post, including an idea on how to make a clasp for the cord.